There are also millions of Palestinians in exile in other areas, especially Jordan – and half a million in Chile. Most Palestinians are Arab-speaking Sunni Muslims, though there is also a Christian minority. They have a strong history of literature, especially poetry, but also many other types of culture. They also have their traditional costumes, embroidered and often quite decorative (though less so than in many Asian countries), though Westerners mostly know the keffiyeh (aka Palestine scarf). Desserts are a prominent part of the Palestinian cuisine, especially pastries stuffed with cheeses, dates, nuts or seeds, ingredients also common in savoury dishes. Another typical food is kibbeh, patties or loaf made out of meat and bulgur wheat. Rice and flatbread are the most important staple starches. Many dishes are vegetarian, often featuring lentils or beans. Numerous herbs and spices are used, including dill, mint, cilantro, parsley, oregano, cumin, cinnamon, coriander, nutmeg, chili, garlic, sumac, allspice and tamarind. Many Middle Eastern classics like falafel, hummus, tabbouleh and baba ghanoush are very popular in Palestine too, and tahini is used in many dishes. I found this recipe in the Arabic Zeal blog. ‘Ataif (or qatayef) are a popular Levantine dessert, often eaten after Ramadan or during other holidays. 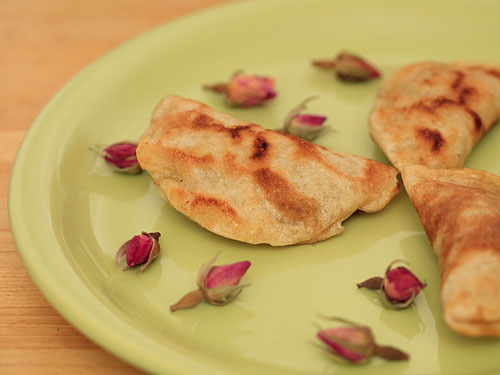 There are many different variations, including baked, fried and simply stuffed ones with different fillings, but this particular one is yeasted pancakes stuffed with walnuts, sugar and cinnamon, baked and dipped into either rosewater or orange blossom water syrup (‘atar). Other than the (clarified) butter used for brushing them this recipe was originally vegan. You can find the rosewater and orange blossom water (orange flower water) at Middle Eastern groceries. Most Indian/Pan-Asian groceries sell rosewater, too. It is inexpensive – I paid less than one euro. Just check that it is meant for food use, as is almost always the case. They are wonderful in many types of desserts and drinks, orange blossom water especially with citrus fruit. I used orange blossom water here as I have a slight preference for it, though for the sake of the photo I pretended that I had used rosewater. Heh. I found the pancakes quite difficult to form into circles, as the dough was thick and sticky (perhaps mine was too thick?). Other than that the process is easy. The result is interesting – quite crispy and a subtle definite yeasty flavour (I think you could probably use half the yeast of the original recipe, but I’m not sure). The nuts don’t really taste toasted at all as I expected. As the pancake shell is dipped in syrup and the filling has sugar too, you first get a sugary taste but the overall feeling is not very sweet at all, because the pancakes aren’t sweetened. Oh, and note that the dough raises quite a bit – I used a 1 liter plastic container and it was near flowing over. First make the pancake batter. Mix the yeast with 1/4 cup of the water until dissolved. Mix all the ingredients together. You will probably need a whisk to get rid of the lumps. Cover bowl with a cloth and let rise in a warm place for an hour. Meanwhile make the ‘atar syrup. Dissolve the sugar in water in heavy pan over medium heat, stirring occasionally. Bring to boil, add lemon juice and boil over medium-low heat for 12 minutes. Once syrup has begun to boil, do not stir again, as this makes the syrup cloudy. Add orange blossom water/rose water and boil 30 seconds more. Let cool. When cooled the consistency should resemble thin honey. Keeps in a sealed glass container in the refrigerator for several weeks. Heat a heavy frying pan over medium heat and add a little oil. Stir the batter and if it feels too thick, stir in more tablespoons of water. Pour 0.25 cup/1/4 dl of the batter onto the hot pan and with the help of the measuring cup (or some other tool) quickly spread it into a circle about 10 cm/4″ in diameter. It will be fairly thick. You may be able to fry several pancakes at once if you have a large pan. The pancakes are only cooked on one side. They are done when the top looks completely dry with no shiny spots, which will take a few minutes. The bottom should be lightly browned. Place them on a clean kitchen towel to cool. Cover until ready to use (they can be stacked, but they may stick if there are any not fully done parts). Combine the filling ingredients together and preheat the oven to 350F/175C. Form the pancakes into pockets by folding them in half, with the baked side on the outside, and pinching at the corners. Fill the pockets with the nut mixture and pinch the edges together to seal (no need for water for this, but pinch tightly). Brush (on both sides) with melted coconut oil or margarine. Bake for 15 minutes without turning or 10 minutes per side, depending on how crispy you want them. Remove from the oven and immediately dip in the syrup to coat and let dry. Serve with more ‘atar syrup on the side. They don’t keep well (they will get mushy), but if you want to eat them later the same day, keep them uncovered to avoid them getting soggy (this may not work in high humidity, though). P.S. The original recipe has illustrated instructions should you need them. Makes about 18 ‘ataif, or enough for 4-6 people. This entry was written on December 20th, 2011 by Maija Haavisto and filed under Desserts and sweets, Middle East, Pancakes and crêpes.